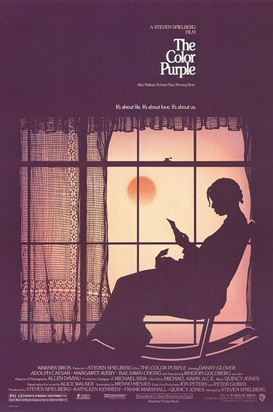 It’s hard to imagine a time when Whoopi Goldberg was in need of an introduction but Steven Speilberg felt it necessary back in 1985 when he cast her as the shy and systematically abused central character in his interpretation of Alice Walker’s Pulitzer Prize winning novel The Color Purple. As Celie, Goldberg carries the burden of a young woman who has been repeatedly raped by her father, an odious man who callously removes the resultant children upon their births. Later when he sends Celie off to live with a stranger she knows only as ‘Mister’ (Danny Glover), she is again beaten and treated like a slave, both in bed and out. Then when her beloved sister Nettie (Akosua Busia) is banished for resisting Mister’s sexual advances, Celie is left utterly isolated. The only intimacy she ever experiences is with Mister’s mistress Shug Avery (Margaret Avery), a bawdy juke joint singer who, in one of the film’s most touching scenes, dresses Celie in her red sequined showgirl outfit and encourages her to smile. It’s a wonderful revelation. And when Shug tenderly kisses Celie and takes her into her bed, a brand new world of possibility opens up. Initially Speilberg wanted Chaka Khan for the role of Shug but it’s only now that the funk superstar has become involved with the material, headlining in a six- week run of the musical version on Broadway. She’s playing Sophia, the big ballsy part that catapulted Oprah Winfrey into mainstream consciousness in the screen adaptation, securing her one of the film’s eleven Oscar nominations in the process. Her journey from feisty female to beaten down lowly maid is heart breaking. But save a tissue or two for the final reunion between Celie and the family she thought she’d never seen again. In fact, save a box.